Is it just me, or was kale not really around in the 90s? I’m sure it was, but as a child I was too fixated on Dunkaroos, those fake cheese snacks with the bread sticks or pretzel sticks for dipping, and Little Debbie oatmeal pies. My family ate healthfully for the most part, but hearty leafy veggies like kale were not exactly on our radar. I ate kale for the first time when I moved to Boston in August 2013. When I hosted a dinner party with new friends, one of them brought sautéed kale with cumin. This same friend brought a kale salad with wheat berries, apples, and a smoked paprika vinaigrette to another dinner party. Kale began to intrigue me. The hearty, earthy flavors mix so well with fresh fruit and smokier spices. The one thing I could not get over was the texture of raw kale. Treated incorrectly, raw kale feels like rubber in my mouth. While raw kale is totally edible, I prefer this nutritious veg braised. What is braising, you ask? Braising means cooking something in a small amount of liquid that will evaporate and allow the main ingredient to caramelize without getting burnt. It’s magic. I love mixing whole grains with salad greens. Sweet Green got me hooked. I feel full, but I don’t experience that food coma you get when you eat too much of that homemade mac and cheese. America’s Test Kitchen’s The Complete Vegetarian Cookbook has a recipe for Braised Kale that’s amazing (I urge you to check out this cookbook, even if you eat meat). I adapted that recipe for the amount of kale I had, and then I added brown rice (I used Trader Joe’s Brown Rice Medley with long grain brown rice, black barley, and daikon radish seeds). Adding grated pecorino romano cheese at the end was the slam-dunk perfect finishing touch. 1. Heat olive oil in a 4-Quart pot or Dutch oven on medium heat. Add the chopped onion and sauté until translucent, about 7–8 minutes. 2. Add the garlic and cayenne pepper, cooking for about 1–2 minutes. Just make sure the garlic doesn’t brown. 3. Add in half the kale and cook it so it wilts down. This is a fabulous ATK tip I learned, and this will allow you to fit all the kale in the pot. 4. Put the rest of the kale in the pot along with the broth and some salt and pepper to taste. Cover the pot and reduce the heat to medium-low. Stir every once and awhile until the greens are tender. This will take roughly 20 minutes. 6. While the kale is cooking, grab another pot and cook your brown rice. Follow your package’s instructions. If you have a rice cooker, even better. My parents just got an Aroma rice cooker and love it. 5. Now, remove the lid of the pot with the kale and increase the heat to medium-high. Cook the kale until the liquid has pretty much evaporated. This will take about 10 minutes. 6. Turn off the heat and add the lemon juice and any additional salt and pepper you may need to the kale. 7. 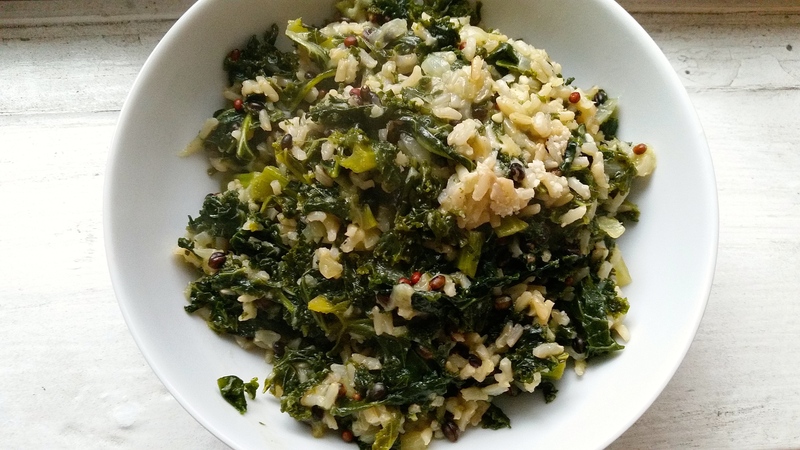 Take your now cooked brown rice and add that to the pot of braised kale. Mix together. Then add the pecorino romano cheese and mix until combined. There’s nothing better than food that is super healthy and super easy to make. If you are just getting introduced to this leafy vegetable, I guarantee you’ll love this dish.